​​We began the day early this morning as we loaded our luggage on the coach and left Munich for the Bavarian Alps. 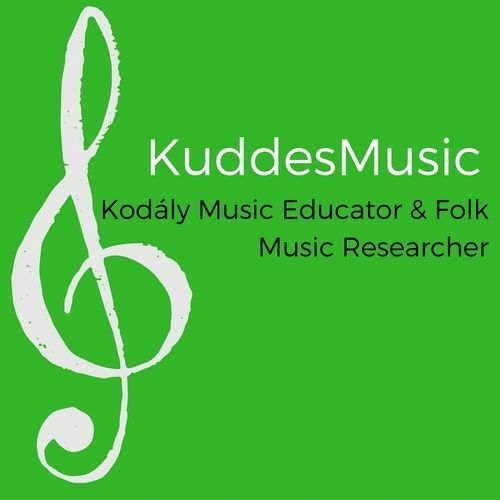 Our first stop was the little town of Andechs, Germany and the ​Carl Orff-Grundschule (Primary School) there. We were treated to a sweet demonstration lesson with 2nd grade students taught by Frau Regina Schussel (pictured below with the children). They began with a greeting song, followed by a action song with clapping, stamping & patching and another with a story about trumpets, drums & flutes playing off in the hills. 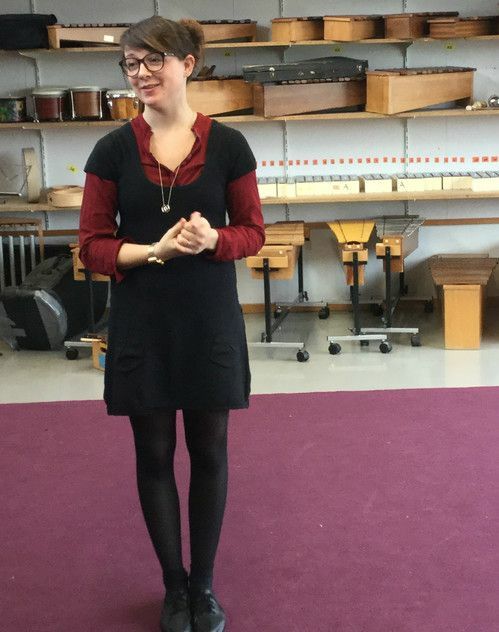 Following this lesson we were introduced to Isabel Erling (pictured below during her lesson) who studied at the Orff Institute and now teaches children in the after school program at this little school. 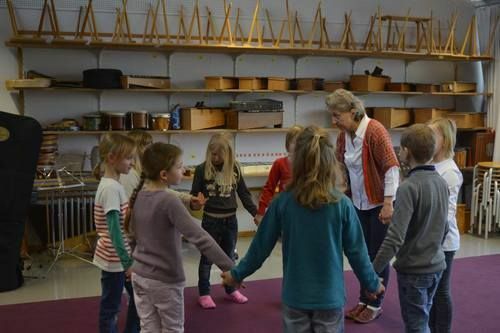 She lead us through a fun activity in which we did some vocal exploration, created a Spider Web and used it as a source for movement and musical improvisation. She was young and fun and we enjoyed begin active music makers. ​​Following the school visit, we climbed the big hill just behind the school to the Kloster of Andechs. The first stop was the chapel at very top of the hill where Carl Orff is buried in a beautiful side chapel. (Picture at the left is our tour director, Shawn Chou & Dr. Julie Scott at the grave.) 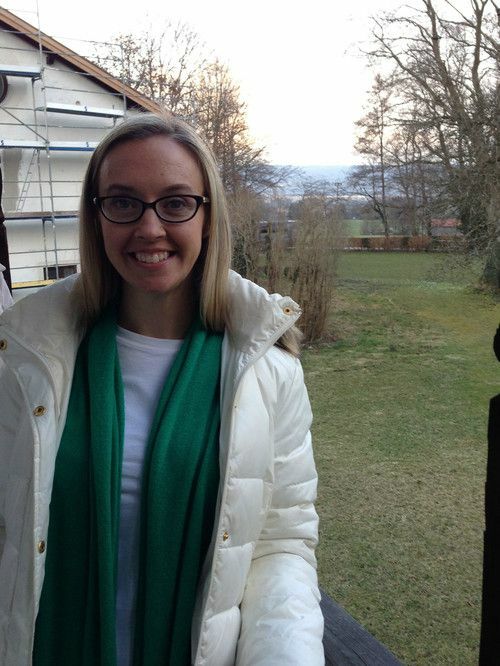 He chose this location because it is the church he could see from his home across the Ammersee lake. After we had paid our respects, we walked 1/3 of the way down the hill to the gift shop for a few mementos. Then we continued down another 1/3 of the way to the brewery that has made this little Kloster famous and kept the Brothers in business for centuries for a mid-morning beer! Then back to the bus and on to the town of Diessen. ​Properly called Dießen am Ammersee or "Deissen on Lake Ammer" this is a picture postcard of a town with close ties to Carl Orff. 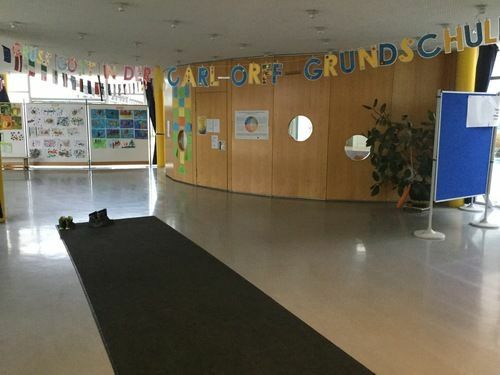 At the Carl Orff Volkschule we saw a 2nd grade movement lesson. While the basic movement was improvised by the children, they had planned some of the signals ahead of time. One of the students "conducted" the group's movements with these signals and a small ensemble of instrumentalists accompanied with improvisations of their own. This lesson was followed by a small 4th grade choir. They began with vocal exploration to get the voices warmed up. This was followed by the singing of several traditional songs. They were so proud to share their singing with us today and it was fun to listen to them. After the lessons we were invited to lunch in the school cafeteria. The students set two long tables with real cutlery and our schnitzel was served on real plates! 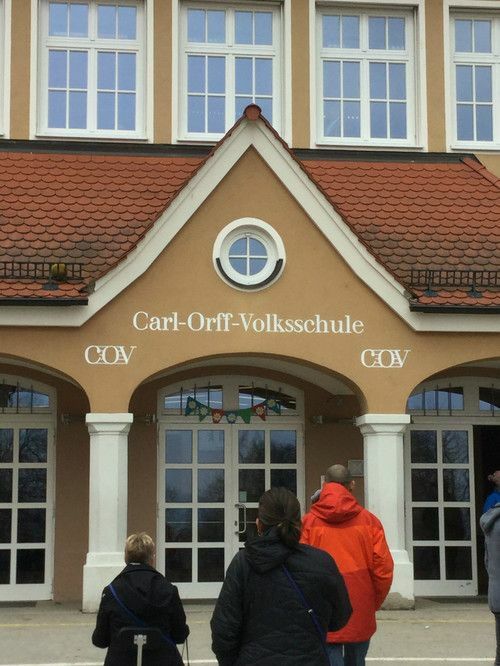 ​Following our hearty lunch, the next stop was the Carl Orff Museum housed in building near the center of town. This is a small museum is dedicated to Orff's life and work. The upper floor outlines his life and the dates of his large-scale compositions. 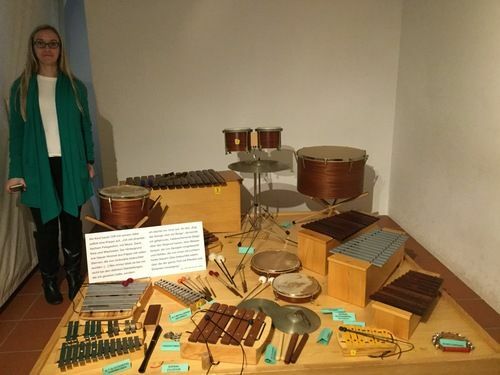 The lower level is dedicated to the Schulwerk with a display of some of the first instruments from Studio 49 (pictured below with Kristin Moore). 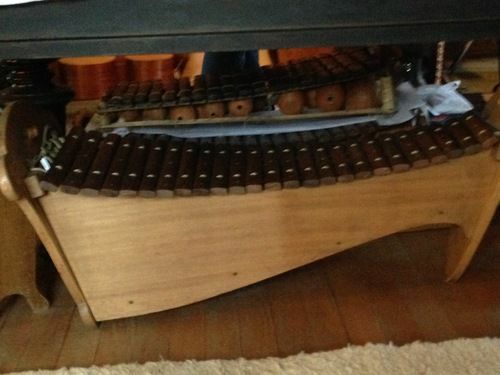 This German manufacturer of classroom instruments was founded by Klaus Becker–Ehmck and named for the year 1949, when they began production of these instruments to Orff's specifications following near total destruction in World War 2. ​The last big stop of the day was the highlight, at least for me. 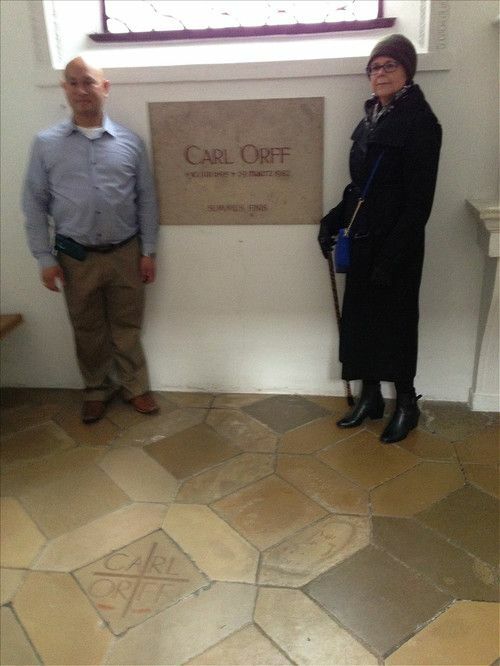 Because of Dr. Julie Scott's connections, we were invited to visit the offices of the Orff Foundation which is in the former home of Carl Orff and his 4th wife, Liselotte. 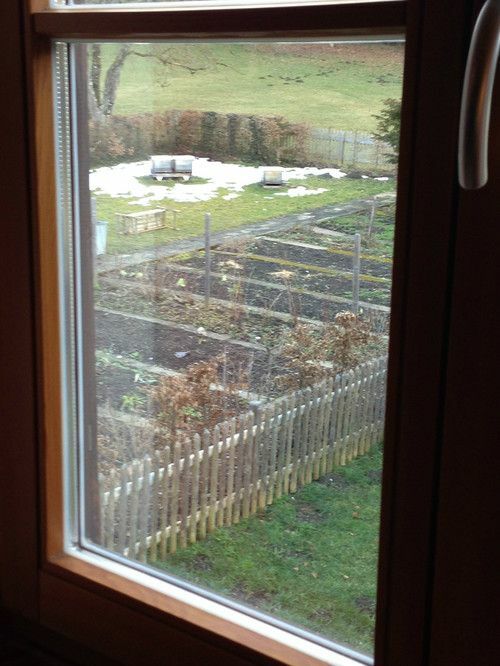 It is a beautiful little farm (photos below) just outside the town where the composer lived and worked from 1955 until his death in 1982. The house itself is undergoing a major restoration, which will be beautiful when finished. The Foundation offices are in the lower level of the outer building. The upper level is Orff's workshop (pictured above) which has been renovated and preserved as it was when Orff was working and composing there. The shelves are full of his books and scores, many of the early instruments, his pipes and rock collection are also on display. It was a powerful afternoon standing on the ground where Orff worked and lived. We were treated to coffee and delicious cake by the Foundation Director, Frau Hermann, and then jumped back on the bus for our trip to Salzburg. While not terribly far in miles, as the crow flies, the trip around the lake and into Salzburg takes about 2 hours. On this evening, it took a bit longer due to traffic and the wintery weather mix that fell during our journey. We arrived around 8:00 pm at the Hotel Elefant in Old Town Salzburg and after settling into our rooms, we gathered spontaneously in the hotel restaurant for dinner before bed.